The core function of the program is to send valid NMEA 0183 sentences out via user configurable PC serial communications ports. The data can be picked up and processed by various navigation equipment supporting the NMEA protocol. This allows very comfortable testing of your NMEA products in your own environment so that the need for field testing will decrease dramatically. 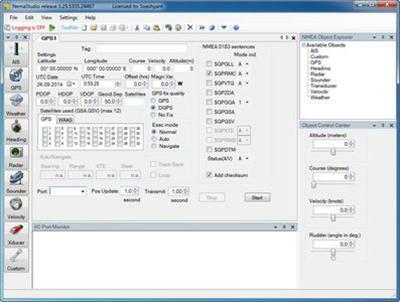 Virtual instruments with configurable dynamic settings give you full control over your test parameters. Using NemaStudio will also let you conveniently demonstrate your products in your own showroom or at fairs and other events without the hassle of installing, connecting and calibrating real NMEA instruments. NemaStudio will also save you a lot of money because you don't need to purchase 'real' NMEA devices anymore to test your NMEA related products. Aids to Navigation (message 21). Custom (your own proprietary sentences). Instruments, targets and ports can be matched and mixed, meaning you can have multiple instances of several objects transmitting over the same or over different ports simultaneously. Dynamic parameters that are common to all objects (altitude, course velocity and rudder) are collected in one panel called "the control center". Common parameters that are more static of nature are configurable under a separate tab. The settings and the "current state" of all objects can be optionally saved upon exiting, so when restarting the program you can continue where you left off. The graphical user interface (GUI) is very flexible, with resizable panels that can be hidden and repositionned at will. NemaStudio includes an embedded text editor for easy editing NMEA data without the need to leave the program when text editing is required.